The new Fortnite era is coming! Season 5 lives out its last days (or even hours), and Season 6 is stepping on its heels. This new season is already thrilling us with teasers and guesses. What new skins will appear there? What new locations to discover in Fortnite Season 6? Holding breath, we all wait for Thursday to come. September, 27 is the date of the official release of Fortnite Season 6. Prepare your controllers and keyboards, have a good sleep on the eve of, and accumulate all your internal resources for the fierce fight! The official Fortnite twitter message claims: “All great parties need a DJ”. Ok, we won’t call in question this fact, but what on earth does it mean? Maybe the hint is hidden in the Season 6 poster? The lama depicted on it is really looking like a DJ. And likely this is one of the new characters we are going to meet in Season 6. Another guess comes with another Fortnite Season 6 poster. Are they trying to say that the events are going to take place on the Wild West? 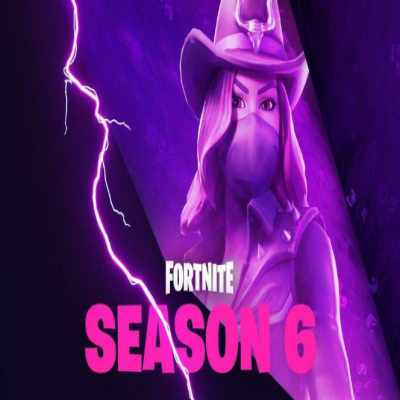 A cowgirl with a bandana upon her face is probably the next new skin for the Season 6. Should we also anticipate a Wild West location on the map? Among other map concepts, there is an idea about Crazy Castle comeback. This will lead to medieval characters emergence for sure. Some fans presume that Season 6 will be packed with the wildest maps of the mirror universe and will even consider time-traveling. We can only say for sure (for 99,9%, to be exact) that the Fortnite Season 6 is going to offer the location somehow connected with Kevin’s relocation. Kevin is a giant purple cube rolling through the Season 5. For a few previous weeks, it spun around the map and left large runes in a few places. These purple runes cause a large circular field with low gravity around them. Isn’t it a clue for the Season 6? There are more questions than the answers. However, there’ not long to wait. Except for a good sleep before the release date and comfortable gaming place, you can prepare yourself for the Season 6 with good investments in Fortnite. As every season before, Fortnite Season 6 will consist of a free and a paid version. The paid one will cost approximately $ 9.99 with many skins included. It is undoubtedly one of the best investments in Fortnite. So if you earned some amount of V-Bucks in Season 5, simply use them to improve your Season 6 gaming experience. Prepare to face new challenges, along with new skins, map locations, and abundance of purple. DJ llama or The Cowgirl? Parallel universe or Crazy Castle? Who cares? Season 6 is going to be abso-fortnite-lutely awesome!